Hostel One has a 4 full weeks cancellation policy. Failure to cancel within this time will result in a cancellation charge equal to the total reservation. Cancellations are only accepted by e-mail only and must be received by us at least 4 full weeks before the arrival. To confirm your booking, you will need to provide 50% of the total amount in advance. Payment can be through credit card or we can give you our bank details for direct debit. Your booking will be confirmed once payment is received. The balance will be paid 4 weeks before arrival. If you do not show up for your reservation the amount charged is not going to be refunded and your booking will be cancelled. 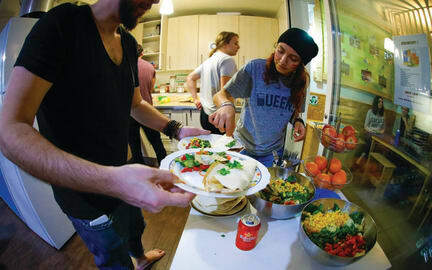 A hostel designed, run & loved by travellers for travellers! Even though we are a chain each of our hostels are unique & are centred around the most important elements for any hostel lover. Great Atmosphere, Spacious comfy accommodation & the way to any traveller's heart FREE DINNERS! As well as being located walking distance to many of the main sights such as La Rambla, Montjuic & the waterfront. We are also next to the super efficient metro of Barcelona, so it really is the perfect place to call home whilst you explore our beautiful city. We will not bore you with the obvious free facilities we offer like our super fast WiFi, our large private lockers and our soft fluffy towels. FREE DAY ACTIVITIES - explore the city and see some of the city's hidden gems that most tourists miss. FREE DINNERS - Join us for delicious homemade food, perfect to meet fellow travellers and start the night right! FREE PARTIES - We take you to some of the city's coolest bars and some of the biggest clubs in Barcelona to experience the magical city by night. EVERY DAY - oh yes every single night and every day we make sure is different! But what really makes our hostel unique and what has helped us win HostelWorld awards year after year, are our amazing staff! As soon as you walk through the front door we will take care of everything. Being travellers we know it's all about the experience and know exactly what makes a hostel experience unforgettable. •3 common areas all designed for different moods. To relax, to work or to party. Mt top o Hostel! Lugar bacana, organizado, social mt bom e os staffs show de bola, principalmente o Mauro! Recomendo! The atmosphere is great, the dinner table brings everybody together, great interaction and time to meet new friends! Everyday has a walking tours! The facilities are good and It’s very clean! Hostel muito agradável, ótimo custo- benefício, excelente instalações, atividades diárias diurnas e noturnas e muito bem localizado. Sem dúvida a melhor experiência em hostel que já tive. Alex, André Leah e os outros staffs foram simplesmente ótimos, companheiros e acolhedores. Me senti em família. O hostel é bem localizado, fácil acesso pelo metro. Boas instalações. Equipe muito atenciosa e sempre com ótima programação! Melhor hostel de Barcelona. Staff sensacional, várias atividades para o dia e para a noite. Ambiente muito bom para socializar com os outros hóspedes. the hostel is amazing! the staff have really good energy and bring the guests together! it was an amazing experience! the best hostel in Barcelona for sure! Mauro who works there took us to some AMAZING bars and clubs! It was the best way to enjoy the Barcelona nightlife! There is free dinner, drinking games and bar crawl every night. So, if you feel like meeting people, this is a perfect place. I've stayed in a 4-bed bedroom. Their bunk beds provides lots of privacy. So, if you feel like resting, it's a good place as well. Showers are very good and bathrooms are always clean. The only suggestion that I have is to fix a hairdryer in the bathroom. They have hairdryer to lend any he reception. However, some guests forget to return and the next one cannot use it. This hostel exceeded my expectations. The energy of the place is very good and the staff is fantastic. I just have to thank you for everything. I'll certainly be back.